To answer this question the afibber should engage in a lengthy discussion with his/her health-care provider which results in a shared and informed decision. Such discussion must cover your risk of stroke, the benefits of blood thinners in preventing stroke, the bleeding risks of blood thinners and the pros and cons of the five oral anticoagulants available to prevent stroke. This scale take the factors we know that increase the risk of stroke and assigns 1 or 2 points. The acronym comes from the first letter of the factors that are known to increase risk as listed to the left. 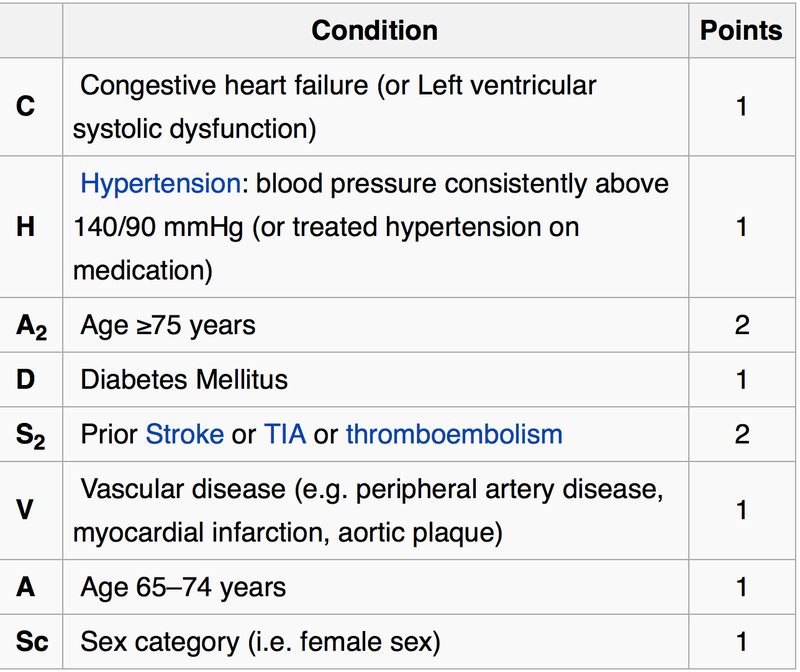 Most of the factors get 1 point, but prior stroke (S) and age>75 (A) get 2 points. 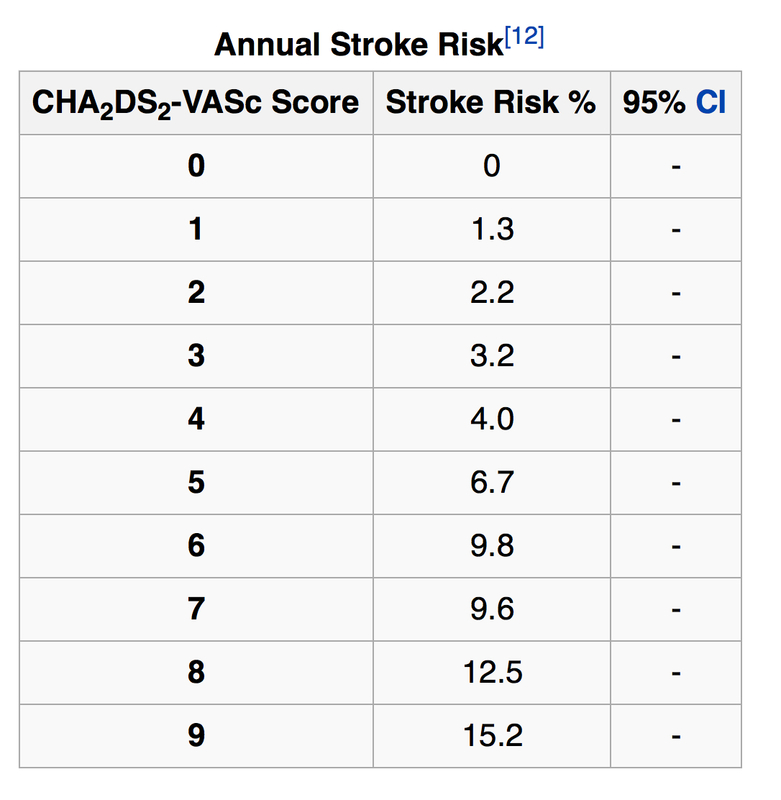 We then add up your points and use another chart (or app) to calculate the risk of stroke per year. Your risk of stroke is very low if you have zero risk factors; it gets progressively higher as you reach the maximum number of 9. Treatment with an oral anticoagulant (OAC), either warfarin, or one of the four novel anticoagulant agents (NOACS), is recommended when score is >/=2 corresponding to a risk of stroke above 1-2% per year. These blood thinners have consistently been shown to lower your risk of stroke or systemic embolization (when a clot from the heart goes somewhere other than the brain) by almost 70%. The higher the risk, the more the benefit of these blood thinners in preventing stroke. Both European and American guidelines recommend using the CHA2DS2-VASc score for initial risk stratification. The European guideline recommends OAC therapy for males with a CHA2DS2-VASc score ≥1 and for female patients with a score ≥2., whereas the American guideline recommends use of OAC if the CHA2DS2-VASc score is ≥2 for men and women. 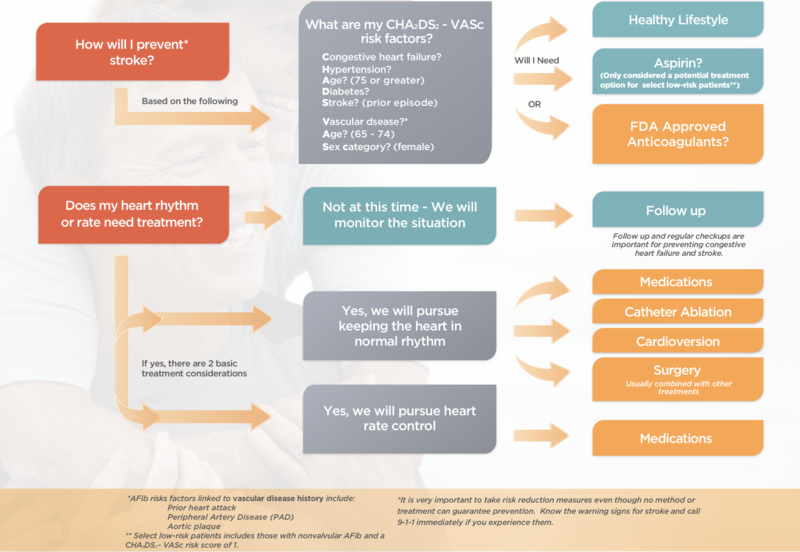 I’ve been using the CHA2DS2-VASc scale for several years in my afib patients. I try to review the patient’s risk of stroke and their risk of bleeding during every office visit, and decide whether they should be on or off an OAC. All OACs cause increase bleeding. They don’t discriminate between bad clots that cause strokes and good clots that stop you from bleeding. If you’re taking one you are more likely to have nose bleeds, bleeding into the intesitnal tract or urine and you will bleed longer when cut and more profusely if in an accident. In lower stroke risk patients, the bleeding risk of OAC of 1% per year may outweigh the benefits conferred by stroke reduction. I wrote a post entitled “Why Does The TV Tell me Xarelto Is a Bad Drug” which points out that law suits against the makers of the newer OACs are frivolous and that these NOACs are likely more safe and effective than warfarin. What was very clear from the study with Pradaxa and stated very clearly in all publications and patient and doctor information sources was that just like warfarin, patients could have severe bleeding complications, sometimes fatal. Overall serious bleeding complications were about the same (the rate of major bleeding in patients Pradaxa in the RE-LY trial was 3.1% versus 3.4% in the warfarin group) but Pradaxa had about 50% more bleeding from the gastrointestinal tract and warfarin about 50% more bleeding into the brain. Another big difference between the novel anticoagulants and warfarin is that we have antidotes (Vitamin K, fresh frozen plasma) that can reverse the anticoagulation state rapidly for warfarin but until recently none for the newer drugs. (There is now available an antidote for Pradaxa). This information also was made very clear to all doctors prescribing the medications in the package insert and educational talks. Despite this, in the major trials comparing these newer agents to warfarin, the newer agents were as safe or safer than warfarin. The most feared bleeding complication on all OACs is bleeding into the head (intracranial hemorrhage). The risk of ICH is between 0.2 to 0.4 percent per year on warfarin. Studies show with the NOACs the risk is about half of the risk on warfarin. Should You Take a NOAC or Warfarin? Once the decision has been made to start a blood thinner, the next question is whether to take warfarin or a NOAC. Warfarin (brand name Coumadin) has been utilized since the 1950s and prior to 2010 was the only drug available for doctors to reduce clot formation in the heart and susbsequent strokes.. Warfarin is only effective and safe within a narrow window and its effects are strongly influenced by Vitamin K in the diet and most medications. Thus, frequent blood testing and adjustment in dosage is needed, and close monitoring of diet and changes in medications. Even with this close monitoring, serious and sometimes fatal bleeding occurs frequently with warfarin. If you do a Google search on warfarin you will quickly discover that it is used as a rat poison. Scientists isolate the chemical from sweet clover that was causing cows to bleed and then developed a more potent form that they named warfarin in the 1940s. After developing blood tests that allowed the drug to be used safely to dissolve clots it was approved for human use in the 1950s. Warfarin or more potent variations on its chemical structure have been utilized as rat poison since the 1940s. The rats are consuming much larger quantities of the blood thinner and are clearly not being monitored for blood thinness. Such misinformation is dangerous and could lead to patients stopping a life-saving medication and suffering a stroke. By the way, in this Xarelto (another NOAC competitor) ad, Kevin Nealon says he chose Xarelto over warfarin because he wanted to eat salads. This is a common misconception and the makers of Xarelto should be ashamed for promulgating it. I tell my patients it is fine to eat green, leafy vegetables while taking warfarin. The Vitamin K in the vegetables does influence the effectiveness of warfarin thinning blood but this is why we check the blood test to determine the appropriate dosage of warfarin for you and your personal dietary Vitamin K consumption , be it high or low. The newer OACs, in contrast to warfarin do not require blood tests for monitoring of their efficacy because their levels are not significantly influenced by changes in diet or most medications. In head to head studies versus warfarin four of these NOACs have demonstrated at least similar efficacy in preventing stroke and at most similar bleeding risk. I have decided to primarily use Eliquis (apixaban) as my NOAC of choice based on my comparison of the different NOAC studies. If a patient’s insurance covers another NOAC better , making it cheaper then I am happy to switch. Because these four NOACs are new and brand name they are significantly more expensive than warfarin. Cost varies substantially based on type of insurance coverage and we can only determine how much a patient will pay for any given NOAC based on writing a prescription and having a pharmacy check out the cost. I have found some patients paying nothing for their NOAC whereas some are paying several hundred dollars monthly. The more NOACs cost, the more likely the patient and I are to choose warfarin. While waiting to determine if cost is going to be prohibitive I will typically provide the patient with samples of the NOAC chosen. The pharmaceutical companies making these NOACs are clearly making substantial profits off them and they are happy to provide lots of samples to doctors to influence the doctors to utilize their product. NOACs are being extensively promoted both to physicians and directly to patients. Physicians have to be especially careful to make sure they are presenting a true summary of the relative risks and benefits of warfarin versus NOACs in light of these constant attempts to influence them. Despite now having four NOACs with similar benefits and ease of use compared to warfarin, the cost of these agents doesn’t seem to have declined significantly from when the first NOAC came on the market. Personally, I would love to see Medicare step in and negotiate significantly lower costs for American senior citizens. An abstract at the ACC meeting in March of 2017 suggested a reduction in medical costs with NOACs despite their high costs. This was related to a lower rate of major bleeding complications: Xarelto cost $542 per patient compared with warfarin’s $500, or $42 more. Pradaxa, cost $367 to warfarin’s $452, saving $85. Eliquis cost $286 charge against warfarin’s $537 resulting in $251 in savings. Data were from from a study of U.S. Medicare patient records. Many patients consider aspirin to be a “blood thinner” that has some benefit in preventing clots and strokes in patients with afib. However, aspirin is not considered a blood thinner or anticoagulant and is more properly termed an anti-platelet agent. 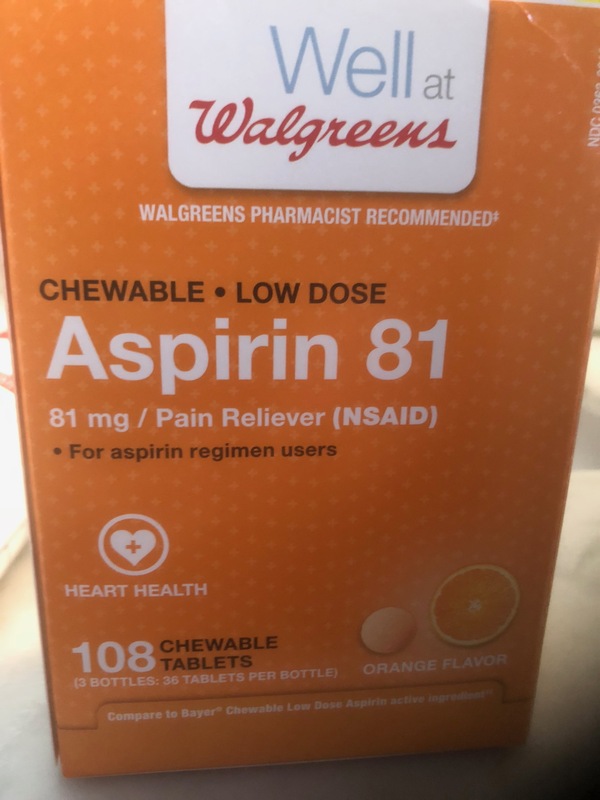 I used to consider aspirin at doses of 120 to 200 mg daily provided some protection against stroke in afib and put afib patients on aspirin who were low risk for stroke or would not or could not take OACs. More and more, however, experts are reaching the conclusion that the substantial bleeding complications from aspirin usage outweigh its very slight benefit in stroke prevention. 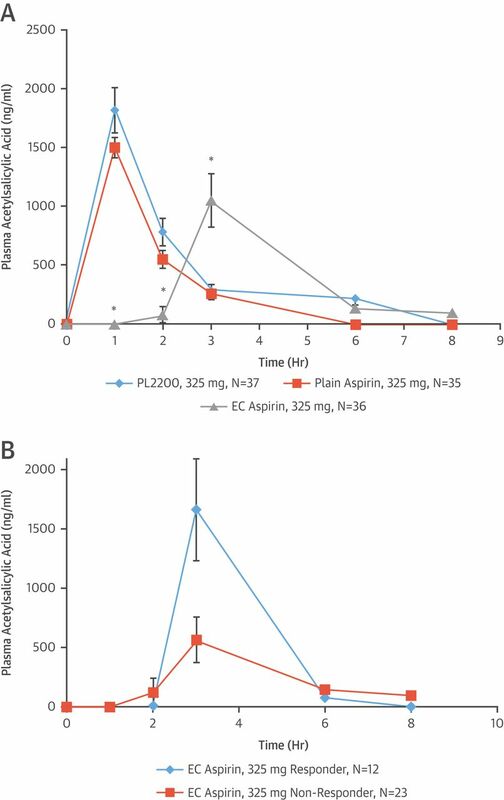 Bleeding risks for aspirin are similar to warfarin and Eliquis. Thus, patients should not consider aspirin as a safer alternative to prevent stroke in afib. Finally, do not take any “natural” supplement that has been promoted as a blood thinner. These are neither safe nor effective. Remember that it took years of scientific investigation and careful testing in animals then humans before warfarin (the agent in sweet clover that caused cows to bleed ) was transformed into a safe and effective anticoagulant. But I don’t find it particularly helpful to assign a disease to a month or a day so my posts on atrial fibrillation come out randomly dependent on the mysterious machinations of my messy mind. It turns out that September, 2009 was declared National Atrial Fibrillation Awareness Month (NAFAM) by Senate Resolution 262 although Stop Afib.org wants us to believe September is eternally NAFAM. However, the email prompted me to better organize my atrial fibrillation and stroke page (now containing all that I have written on the subjects) which I have copied below. How Obesity Causes Atrial Fibrillation in FatSheep and How Losing Weight helps prevent afib from coming back. Foxglove Equipoise. When William Withering began treating patients suffering from dropsy in 1775 with various preparations of the foxglove plant he wasn’t sure if he would help or hurt them. After 240 years of treatment, we are still unsure if the drug obtained from foxglove is useful. Are infographics really helpful? Someone should do a study on that. Perhaps we could use the money we spend on infographics in atrial fibrillation to research whether the left atrial appendage should be excised at the drop of a hat. The first part lays out the problem of AF with patriotic bunting. The second part uses the annoying numerical infographic approach. The third part explains why I got the email. A product is being promoted. The woman who sent me the email works for MyTherapyApp. 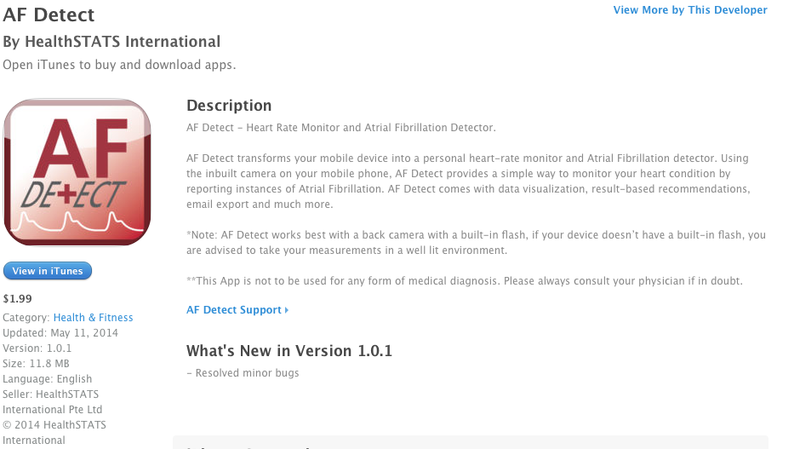 I’m writing this brief post as a warning to any individuals who have purchased the smartphone app AF Detect (screen shot below from Apple app store.) It is not a reliable detector of atrial fibrillation (AF). 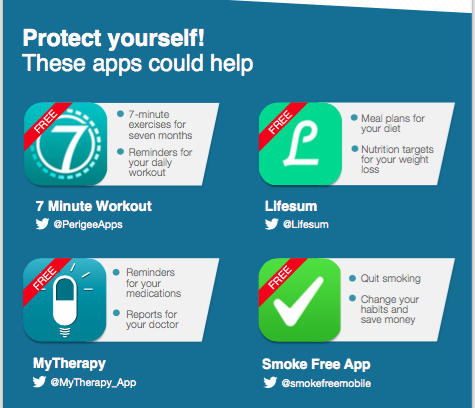 A patient of mine with AF recently purchased this app unbeknownst to me. He relied on its faulty information which reassured hm he was not in AF when in fact he was in AF. Such misinformation has the potential to lead to dangerous delays in diagnosis. There are multiple reviews on the Apple and Google app sites which confirm the total lack of reliability of this app to diagnose AF with multiple instances of both failure to detect known AF and inappropriate diagnosis of AF when rhythm was not AF. In the description of the app the company says the app will “transform you rmobile device into a personal heart rate monitor and atrial fibrillation detector”. 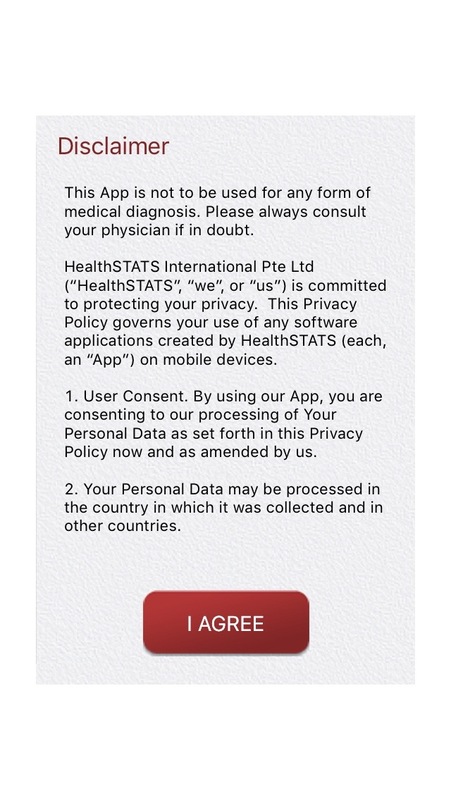 However after purchasing the app and before using it you see this disclaimer which states it is not to be used for any medical diagnosis. I will be performing a more detailed analysis of this app’s performance in the future and contacting the FDA about the danger such inaccurate medical testing confers on victims. The eternal fiancee’ of the skeptical cardiologist (EFOSC) deserves serious kudos for (among myriad other things) challenging his conventional ideas about heart-healthy food and serving as his dietary muse. However, the EFOSC seems to have a weakness for what I would consider a highly processed, sugared up, over-priced piece of marketing hype—Kind Bars. She also points out that for frequent business travelers, the bars are more convenient (and often cheaper) than buying a bag of nuts in an airport kiosk. The “healthy” snack bar business has been booming lately. Consumers, attracted by convenience and a desire for “healthy and natural” food are paying more for snacks like Kind bars which have high profit margins. Are Kind Bars And Their Ilk Healthy? Interestingly, about a year ago, the FDA issued a “warning letter” to Kind asking the company to remove the term “healthy” from its product labels. Violation 1a. of that letter fingers Kind Fruit & Nut Almond & Apricot for having 3.5 grams of saturated fat per 40 grams of food (the so-called Reference Amount customarily consumed or RACC) which is more than the 1 gram of saturated fat per RACC allowed if is one is going to describe one’s food as healthy. This is clearly a ridiculous and out-dated requirement: saturated fats are a diverse category of nutrients, some of which are likely very healthy (see my posts on dairy fat or coconut oil). According to these criteria, foods that are clearly very healthy such as avocados, salmon and nuts, cannot be labeled as healthy. Kind fought back and challenged the FDA and the FDA backed down. As Marion Nestle points out, when it comes to food labels, “healthy” and “natural” are marketing terms. Their purpose is to sell food products. Is this the most annoying advertising blather in existence? Is the EFOSC a KINDAHOLIC with an uncontrollable love for KIND and spreading kindness? The ingredients in the almond and apricot Kind bar are: Almonds, coconut, honey, non GMO glucose, apricots, apple juice, crisp rice, vegetable glycerine, chicory root fiber, soy lecithin, citrus pectin, natural apricot flavor. Basically, the healthy part of this Kind Bar is almonds and coconut, which you could purchase for a hell of a lot less than what you are paying for this processed junk. Also, note that the third ingredient is honey and the fourth is non GMO glucose. What on earth is non GMO glucose? Do we really care whether the added sugar you are pumping into your crappy bars is GMO or non GMO? Is a KIND bar any healthier than these Halloween treats? Is that Jenny in the background, Dr. Pearson’s marvelous medical assistant? “the packaging of the dark chocolate cherry cashew bar advertises the word “Antioxidants.” In other words, the bar isn’t promoted as being low in sugar, so it’s a fair choice to compare with a PayDay. You can buy 24 Payday bars at Sam’s Club for $14, about 61 cents a bar. To be fair to the EFOSC, she usually only eats Kind bars that have about 5 grams of sugar. In a previous post (Nuts, Legumes, Drupes and Mortality) I summarized the evidence supporting the cardiovascular benefits of consuming various kinds of nuts. The PREDIMED trial, in particular, showed a remarkable benefit in reducing heart attacks and strokes when patients ate a Mediterranean diet supplemented with 30g mixed nuts per day (15g walnuts, 7.5g almonds and 7.5g hazelnuts). Walnuts and almonds are actually drupes, but hazelnuts are true nuts. The Mediterranean diet, including nuts, reduced the risk of cardiovascular diseases (myocardial infarction, stroke or cardiovascular death) by 30% and specifically reduced the risk of stroke by 49% when compared to a reference diet consisting of advice on a low-fat diet (American Heart Association guidelines). The Mediterranean diet enriched with extra-virgin olive oil also reduced the risk of cardiovascular diseases by 30%. You can buy 454 grams of walnuts or hazelnuts for $14 , and 454 grams of almonds for $10. Thus, for 46 cents for the walnuts, 23 cents for the hazelnuts and 16 cents for the almonds (total 85 cents) you can recreate the snack that the Spaniards ate in PREDIMED. This compares to Kind bars which retail anywhere from $1.99 to $3.50. “WALNUTS. Walnuts differ from other nuts in that they are very rich in omega 6 and omega 3 type unsaturated fats. Moreover, the antioxidants they contain are among the most powerful in the plant world. It should be mentioned that, like omega 3 in fish, nut fats possess important beneficial properties for general health and the heart in particular. ALMONDS. Almonds form part of many traditional desserts and sweets of Arabic origin, such as nougat. Currently, Spain is the second largest producer and consumer of almonds in the world, after the United States. As with hazelnuts and olive oil, almonds are rich in oleic acid. They differ from other nuts in that they contain more fibre, vitamin E, calcium and magnesium. Unfortunately, I can eat neither hazelnuts nor walnuts (tree nut allergy), but I’ve decided to create for my patients little baggies filled with 30 grams of the magical PREDIMED nut mixture. I’ll give these out during office visits as I explain the glories of the Mediterranean diet (I’ll try to forbear elaborating to them the difference between drupes and nuts). If any reader or patient has a suggestion, please add it to the comments. If I choose your suggestion, I’ll provide you with 10 bags of nuts and oodles of glory! Hopefully, once I start creating the nut bags, the EFOSC will begin to eschew the faux healthiness of Kind bars and embrace the natural and unmarketed goodness of drupes and nuts. A drupe is a type of fruit in which an outer fleshy part surrounds a shell (what we sometimes call a pit) with a seed inside. Some examples of drupes are peaches, plums, and cherries—but walnuts, almonds, and pecans are also drupes. They’re just drupes in which we eat the seed inside the pit instead of the fruit! 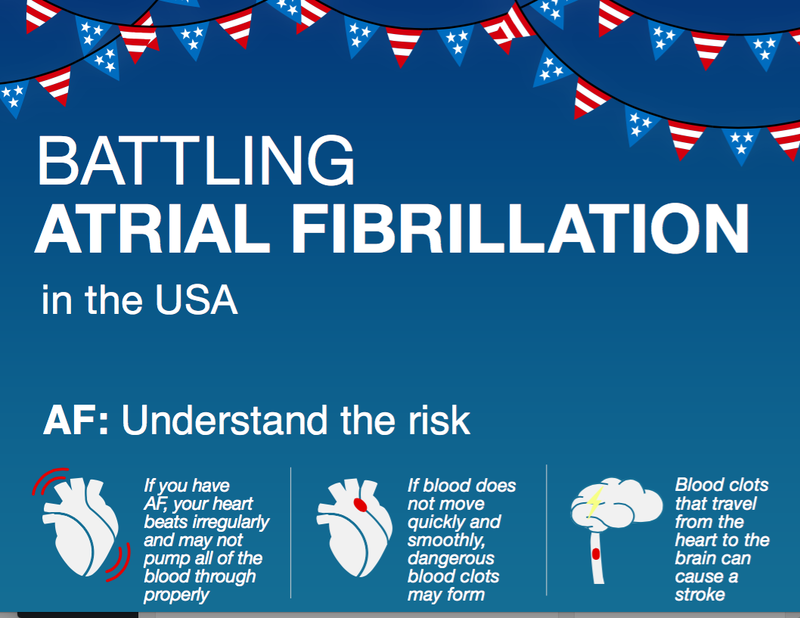 Atrial fibrillation (AF) is a common abnormal rhythm of the heart which causes 1 in 4 strokes. Those afflicted with AF may lack any symptoms or only have a vague sense of irregularity of their heartbeat and thus the first symptom of AF can be stroke. The gold standard for diagnosing AF has long been the electrocardiogram (ECG or EKG) and typically the ECG involves placing 12 electrodes on the chest/arm/legs and recording the electrical activity of the heart on an expensive device. I’ve been checking out a device made by Alive Cor which works with your smart phone to record a single channel ECG and is capable of accurately diagnosing if you are in the normal (sinus) rhythm or in AF. You can purchase the third generation (significantly smaller then earlier versions) AliveCor Mobile ECG from Amazon or from AliveCor directly for 74.99$ and it works with an app with both iOS and Android devices. I used mine with my iPhone 6. At first I carried it separately, fearing the added bulk when stuck on to my iPhone case but after a while I realized that it was never with me when I wanted to use it and that there was a huge risk of losing it and so I used the backing adhesive to attach it to my case. After pairing the device with the app you put two fingers on each of the metal pads and the smartphone screen displays the recording. After 30 seconds of recording it then interprets the rhythm. Typical recording in normal sinus rhythm. The red arrow indicates the small p waves which are the electrical signal of the upper chambers (the atria) depolarizing , the blue arrow indicates the electrical depolarization of the ventricles (QRS). 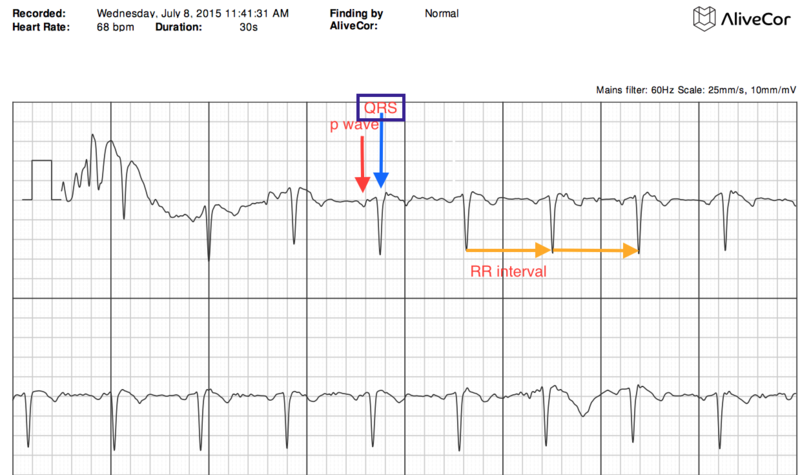 The orange arrow indicates that the time interval between the QRS complexes is the nearly the same for each beat, indicating the regularity that we expect when in NSR compared to AF. Above is a typical recording I made in my office on a patient who had a history of AF. The quality is good and I can clearly see that he is in normal sinus rhythm. The app correctly made the diagnosis of NSR and calculated his heart rate at 68 beats per minute. One day I had most of my patients record their ECG’s using AliveCor and compared it to the standard 12-lead ECG we normally record. The device correctly identified the two patients with AF out of this group and correctly identified the normals. This recording is from a patient with persistent AF which had recurred two weeks earlier. The device correctly identified AF. 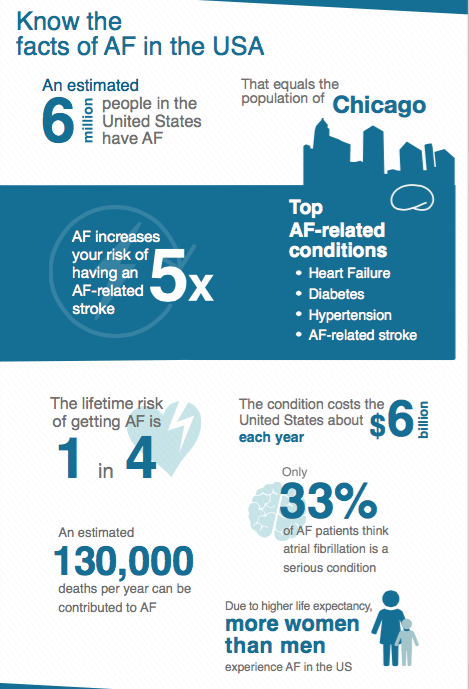 Given the high prevalence of silent AF, the strong association of AF with stroke and the availability of anticoagulants which reduce AF associated stroke by 70%, screening for AF with devices like AliveCor holds the promise of preventing large numbers of stroke. 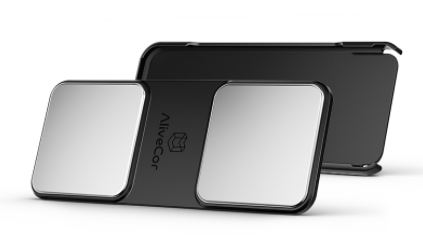 AliveCor allows physicians utilizing the Mobile APP and ECG to have a “dashboard” into which their patients can transmit their AliveCor ECG recordings. I will be discussing this remarkable new device with my AF patients who are smartphone enabled. I think it will advance our ability to more efficiently and quickly diagnose AF in them. My standard approach if a patient with AF calls and says that they feel like they are out of rhythm is to have them come into the office for a full 12-lead ECG. If they are AliveCor enabled, they could make their own recording, and we could review that remotely and make a diagnosis without the office visit. Let me know your thoughts on smartphone ECGs.